Interchange is the network which facilitates the flow of funds from issuing banks to acquiring banks. It is a also a fancy industry word for "cost." The interchange rates are the rates prescribed by the card associations (V/MC) to charge acquiring banks and credit card processors for the processing of credit card transactions. First Bancard LLC is the first company in the credit card company industry to nationalize its pricing structure. We offer all merchants the same low priced deal: Interchange (cost) Plus 0.15% (or 15 basis points) of profit and $0.06 per transaction. THIS IS FOR INFORMATIONAL PURPOSES ONLY. THIS IS THE OUTDATED "TIERED" PRICING STRUCTURE THAT EXISTED IN 2004. The first type of merchant was considered a "retail" merchant: a storefront location where a card is swiped and the sales draft is signed. Merchants who are in the Retail category get quoted a "Qualified Discount Rate." Because many businesses do not operate on a face-to-face basis with their customers, the card associations (V/MC) created a second category for merchants: MOTO (Mail Order / Telephone Order) or Internet. This category of merchants primarily "key-in" their credit card transactions, since the merchant's sales are not done face-to-face. Merchants who are in the MOTO/Internet category also get quoted a "Qualified Rate," but for all intent and purpose can be considered a "Mid-Qualified Rate." Let's say you are a Retail merchant, and instead of swiping your customer's credit card, you key it in. Due to the fact that keying in a transaction is more risky than swiping, you will get surcharged a Mid-Qualified Rate. 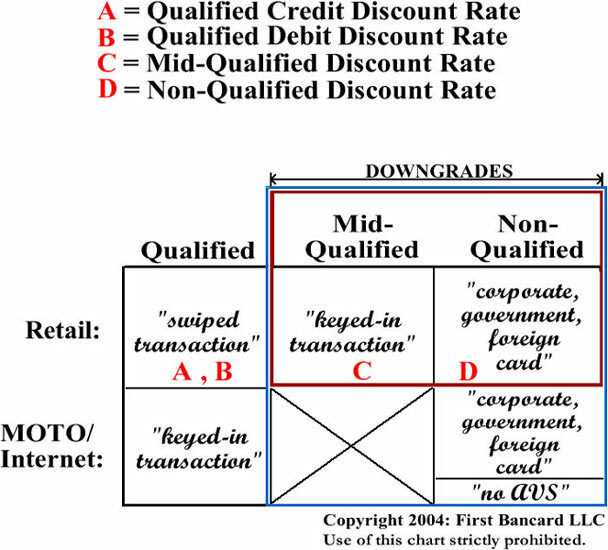 Also, if your customer presents you not with a consumer credit card but with a corporate, government, or foreign credit card, you will get surcharged a Non-Qualified Rate, because these types of cards are the riskiest cards in the industry today. The reason why is because there is no "ownership" of the card as compared to a consumer having an agreement with an issuing bank (i.e. a consumer credit card). 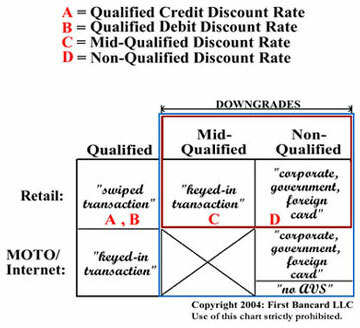 Whenever a merchant is assessed surcharges due to the transaction qualifying at the Mid-Qualified or Non-Qualified level, these transactions are known as downgrades. Interchange (cost) + 0.15% + $0.06 per transaction. 24/7 Technical Support & free equipment replacement. Cancel your agreement at any time without penalties. First Bancard LLC is a Registered ISO/MSP of Fifth Third Bank, Cincinnati, OH. All transaction processing performed by TSYS and First Data Corporation.